then the next time you start the bike you have zero end float until the cases get at least as hot as they were when the bearing moved. happened to my bike once.. at around 80 hrs I think .... i thought it was going to be stuffed for sure ... could not get the bearing to move back until it bike was really hot.. took 30 min easy riding before the bearing moved again and I got the end float back by tapping the end of the crank with a mallet. Interesting Just to ask a stupid question, can you tell what the end float is without splitting the cases? I'm assuming it wasn't that you noticed at 80 hours that the bike was acting was funny, split the cases, saw the bearing had moved, put it back together and gently rode it back into place ..? just remove the ignition cover, put a dial gauge on the crank and measure the axial play. Just out of curiosity, what is the downside if you have too much axial play in the crank? Earlier in this thread was mentioned that setup where one side bearing was locked in the crank. What are your opinions on doing that on this engine? I mean if you make a spacer between the left side bearing and the gear so the crank stays locked in the left side and the right side is free to move on a roller bearing? however most of the development and testing of different mains configurations we have access to comes from the RFS builders with 540 - 640cc builds (there are simply more RFS engines being big raced and tuned than bergs) and none have found any problems with the mains at crank end floats set up to 1mm. I ran 1mm float on rollers for 100 hours in my 700 nothing went wrong. the setup you use I think is great if it works for you, and I'd like to be crystal clear that I think anyone who has found a setup to work for them should be happy with it. IMHO the NTN rollers are the best option they are cheaper than the SKF bearings and to date there is no record of them failing in 1000s of builds even with floats down to 0.15 - 0.2mm. Orangeberg noticed the KTM race team using them in the finke desert race here in aust as they were fitted as OEM parts to the ktms.. no failures in the RFS bikes... the bergs in the same race fitted with SKFs had issues at similar end floats. 1) because the ball bearing has a much lower load rating than the rollers around 22Kn for the ball, 44Kn for the roller and the spherical rollers I use are 84KN http://www.vxb.com/page/bearings/PROD/30mm/Kit10509. 3) the axial loading due to crank spread is shared between the 2 bearings so no matter what you put on the drive side, the ign side still gets the same axial loading. this comes from The American Bearing Manufacturers Association standards and explains the different types of misalignment and how they affect the load capacity of roller bearings. I posted it up in 2009 somewhere but it should go here as well. ABMA standards state that optimum dynamic capacity C values refer to roller bearing mountings so designed and executed that uniform load distribution over the active roller length is assured. it is further stated that if misalignment is present a reduction in the capacity value should be made. 2 types of misalignment: A location misalignment, and B deflection misalignment. location misalignment implies misalignment in a plane at right angles to the direction of the load. this type is assocoated with skewing of the rollers on the roller track and resultant distortion of the contact area. location misalignment may arise as a consequence of 2 bearing supports some distance apart being out of line. though very undesirable this type of misalignment is not as serious as deflection misalignment and does not result in large bearing capacity reduction. Deflection misalignment misalignment in the same plane as the direction of the load. this type is ascocitaed with a tendancy toward digging in of the roller ends on the roller tracks with resultant high stresses at these points. with straight non crowned, cylindrical rollers this condition is much more exaggerated than in designs incorperating crowned cylindrical rollers. This is one helluva thread, I'm very happy I read it before attempting any rebuilds. I have seen it mentioned somewhere, as usual having difficulty finding it again, about the inner races spinning on the crank. Is this the same cause as the bearing failures, the rollers pinching the inner race and spinning it when the crank flexes, or would it be because the fit between crank and inner race is not tight enough? Or maybe a little bit of both. both the crank and the inner race are steel so the interference fit can only really change if the bearing is the main heat source .. a ball or roller bearing overloaded axially. yes poly cage is going to cause the least damage but is more prone to embrittlement from heat, and not as good at maintaining alignment of the rollers, id also think that in these bearings the rollers and the inner races fail first not the cage. What would one do regarding the slipping inner race? should I change to a ball bearing setup in this case, or try rechroming that part of the crank and machine it back up to spec? I noticed the Honda 450X inner race is a slip fit on the crank, it can rotate freely by hand, but then I suppose the crank was made to work like that, so having a slipping race on the BerG crank would not be ideal.. I know the Honda engine.. the roller bearing never sees any axial loading because the ball bearing on the other side is fastened securely to the crank and also to the case, there is 2mm+ room between the end of the rollers and their "lip" so the inner race doesn't have a reason to slip and because its loose anyway there is no damage caused if it does slip. 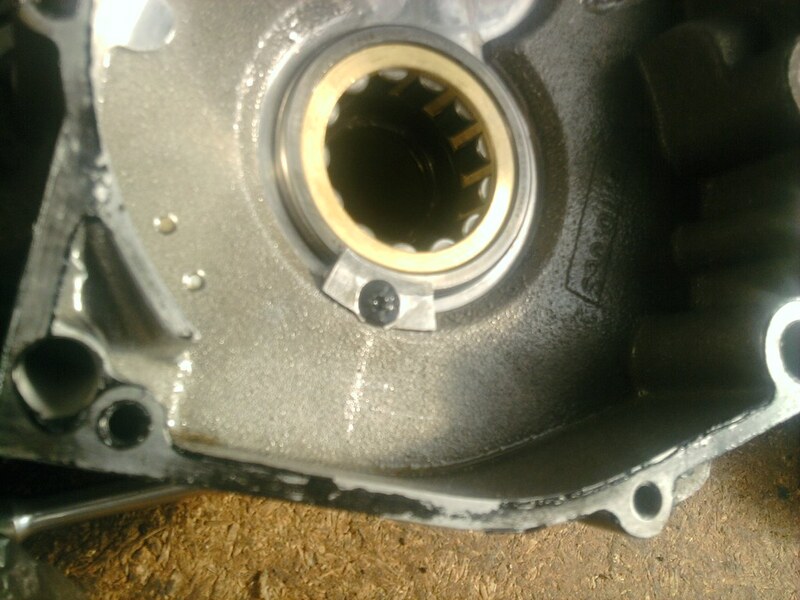 or make it tighter and try to stop it spinning which is just fighting with the problem, it will surely stop the race spinning and reduce the radial clearance in the bearing but its not really an elegant solution. something to watch is the radial play, not sure if I put the specs above but the recommended radial clearance as installed is 0.04 to 0.07mm. radial play was 0.02mm .. this bearing was on the less loaded ignition side but wore out more quickly than its partner which had 0.05mm radial play.